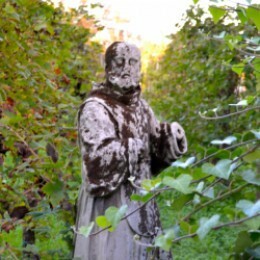 A garden statue tucked away in a vineyard on Torcello. All photographs on this page are by the author, sockii, unless provided by Amazon. One of my absolute favorite places to visit while in Venice, Italy is the quiet, rural island of Torcello. 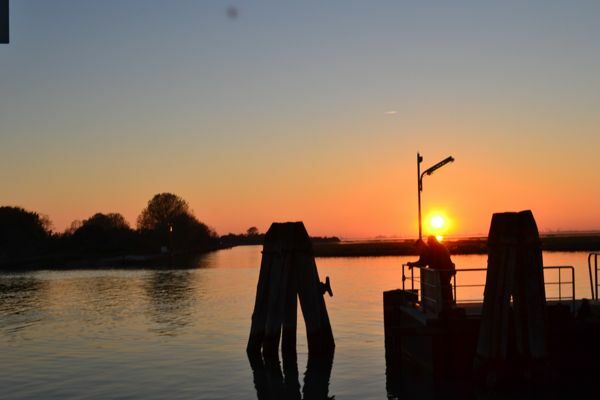 Many tourists bypass Torcello or perhaps only spend an hour or so there, instead focusing on nearby Murano and Burano in the northern Venetian lagoon. 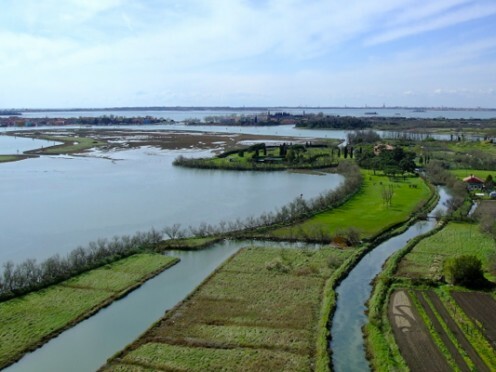 But Torcello is a beautiful island rich with history and importance in the development of the Venetian Republic; indeed, Torcello was one of the first lagoon islands to be successfully settled and for a long period of history was considered far more important than Venice. It is the location of the oldest church in the lagoon and there are several noteworthy archeological and historic sites to see while there. While at one time the island was home to 20,000 inhabitants, today it is sparsely populated with fewer than 30 residents (not counting its many cats). 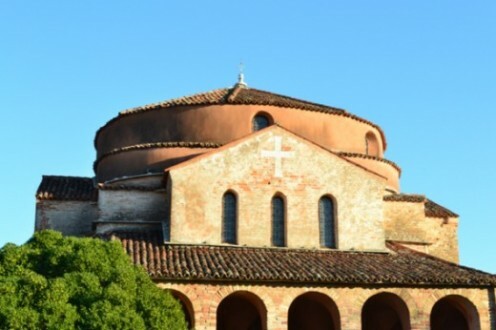 This page will guide you through the history and major attractions of Torcello you should consider visiting while in Venice. 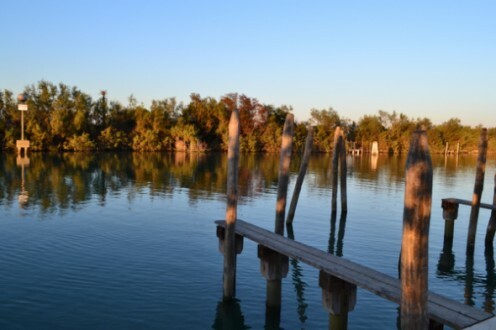 Learn how to get to Torcello, when and what attractions to visit, as well as what amenities are on the island including wonderful restaurants and one very exclusive hotel. Torcello was first settled after the fall of the Roman Empire, as barbarian invasions (including those led by Attila the Hun) on the mainland lead many to flee and seek new shelter in the Venetian lagoon. 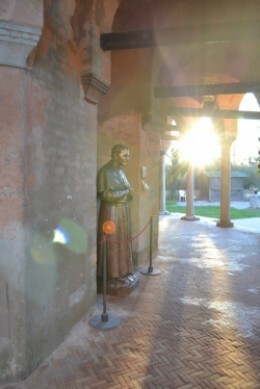 In the 7th century, the Bishop of Altino decamped with the population of his city, and fled to the island of Torcello. The Bishop brought with him relics of Atlino’s first bishop, St. Heliodorus, who became then the patron saint of Torcello.Torcello slowly developed a certain independence from the Byzantine Empire and started to prosper and thrive by maintaining trading and cultural ties to Constantinople. By the 10th century nearly 10,000 called Torcello home, and there were no fewer than ten churches and several convents on the island. At that time it was more important than Venice itself. However, changes to the lagoon waters themselves would lead to Torcello’s downfall. Beginning in the 12th century the saline marshes of the island became more of a swamp, making navigation of trade ships impossible and aggravating an already difficult malaria situation. Those living on Torcello began to flee to nearby Murano, Burano and Venice. 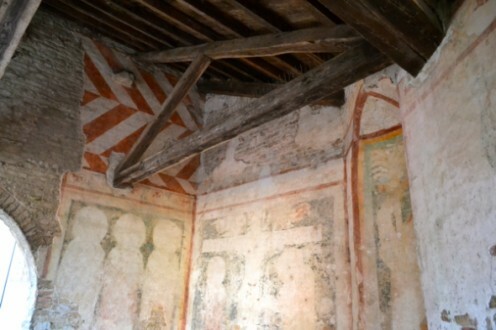 Nearly all buildings including churches and palazzi were eventually dismantled as islanders reused the materials elsewhere; only the remnants of four medieval buildings survive from this early glory period today. 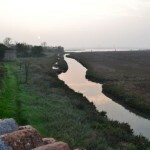 In the 17th century the Sile and Dese rivers were diverted and the waters around Torcello saved, but by then the island had been nearly deserted, its importance in Venetian history strictly limited to the past. This Italian-language volume was published in 2009, in conjunction with an exhibit at Venice’s Diocesan Museum of Sacred Art. 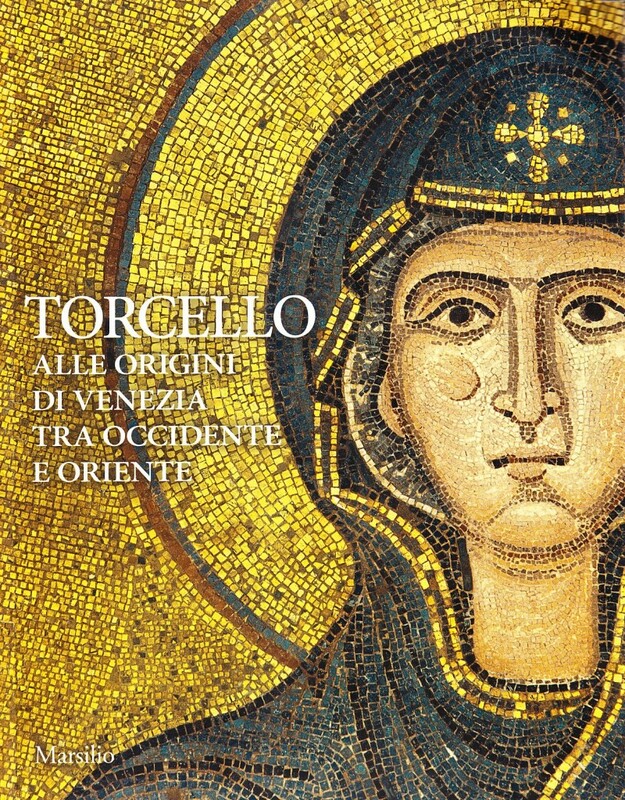 Along with being a catalog of works on display in the exhibit, this book also includes some of the latest studies on Torcello, its cathedral, and the unique cultural climate where Eastern and Western ideas combined in the Venetian lagoon. Peaceful waters on the rural island of Torcello. 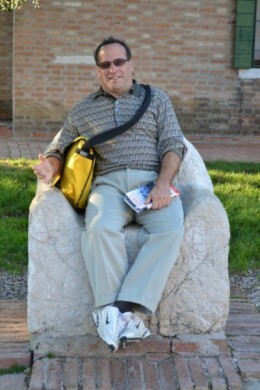 Outside the Santa Fosca Church on Torcello. 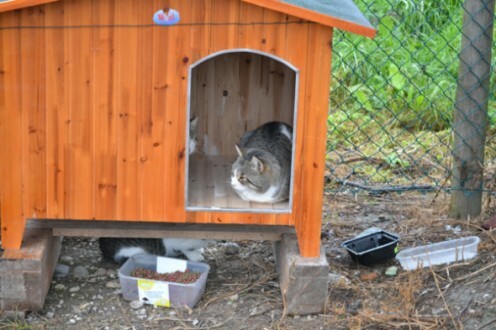 Shelters provided for Torcello’s many feline residents. 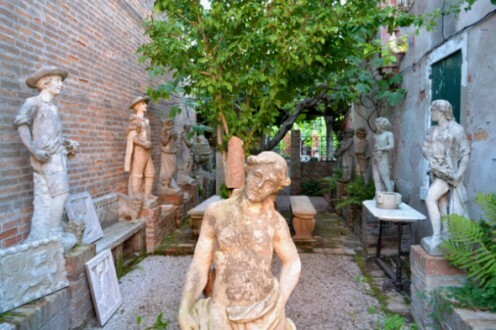 An alleyway on Torcello filled with sculpture and stone. On a beautiful day it’s nice to take a boat out on Torcello’s canals. 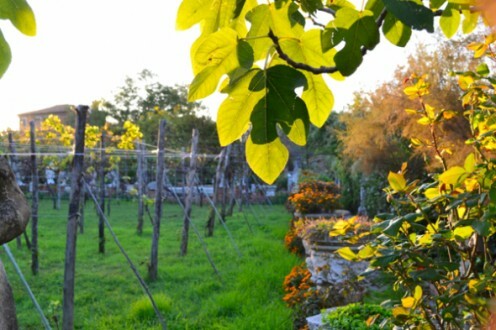 Sunlight shines through the leaves on a lovely garden on Torcello. The remnants of an ancient fresco painting on Torcello. 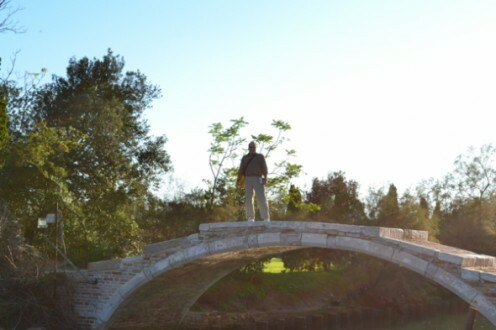 Crossing the famous “Devil’s Bridge” of Torcello. A view from Torcello’s bell tower, looking over the church structures. In the distance one can see nearby colorful Burano and Mazzorbo. It’s a simple ride by vaporetto from Venice! At the dock, waiting for an evening boat back from Torcello. Torcello is served primarily by the Number 9 vaporetto line between Burano and Torcello, operated by Actv. (It is also on the N or “night” route, so don’t worry about being stranded there overnight. But evening stops may be very infrequent.) The easiest and fastest way to get there from Venice is to catch the number 12 vaporetto boat from Fondamente Nove in Venice; it will from there stop at Murano, Mazzorbo and then Burano. 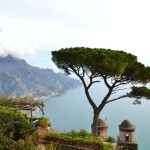 Get off on Burano and walk to the nearby stop for the number 9. The 9 runs every 30 minutes and it takes only a few minutes to cross to Torcello. Of course, you can also hire a private water taxi, but the price for travel will be significantly more expensive than using the vaporetto. 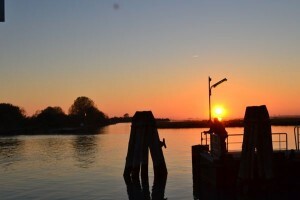 Just make sure you have a ticket that will be valid for both your travel to and return trip from Torcello. What remains today of Torcello’s past glorious structures. 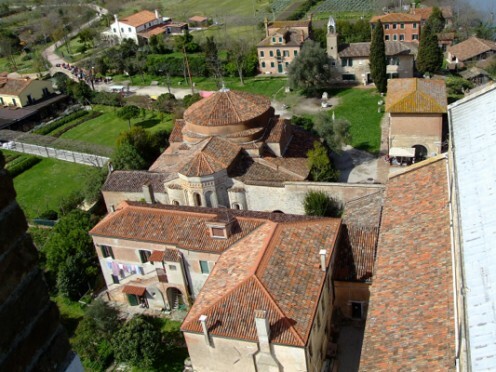 Hitting the major sights on Torcello can all easily be done in one morning or afternoon. 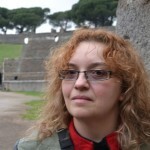 Often visitors choose to do so after or on a combined visit to nearby Murano or Burano. 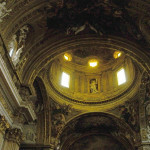 The ticket office at the main complex will sell you individual or combined tickets to the island’s attractions; a special “Secret Itineraries” tour of the Basilica will allow you entry to points otherwise inaccessible to tourists, including the crypt and the sacristy. Take a seat in Attila’s Throne…everyone does it! Cathedral of Santa Maria Assunta The oldest religious edifice in the Venetian lagoon, this church has been dated back to the 7th century. It is notable as a fine example of Venetian Byzantine architecture and for its stunning interior mosaics. Chiesa di Santa Fosca This church was constructed in the 11th and 12th centuries in the form of a Greek Cross. Its simplicity in form and design is startling and moving, worth a visit to reflect in quiet. Campanile di Torcello When open (during our last visit it was closed for restoration), the bell tower of Torcello is worth a slightly strenuous climb for its impressive views. 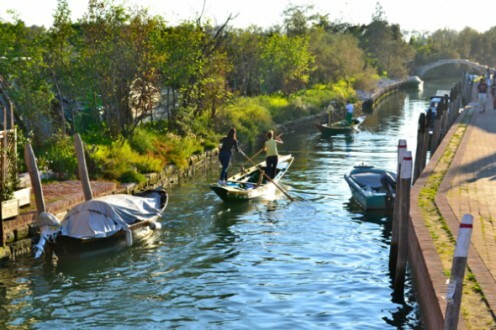 You can take in not only all of Torcello but the nearby islands of the lagoon, including Burano. 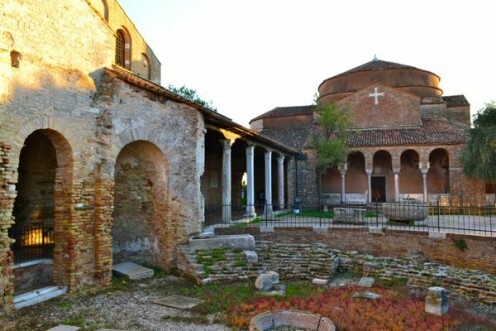 Torcello Cathedral Venice Italy | Book Entrance Tickets & Guided Tours Once the palace of Torcello’s council, the museum is now home to artifacts and archeological finds related to the island’s history. Attila’s Throne Nearly everyone who visits Torcello takes a moment to snap a photo sitting in Attila’s Throne. 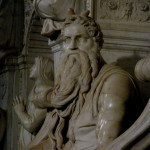 However, the ancient stone chair was put in place 100 years after Attila the Hun’s death and is much more likely the bishop’s chair. Ponte del Diavolo You will encounter this ancient stone bridge on your walk from the Torcello vaporetto stop to the basilica. Contemplate the moving, powerful mosaics inside the church of Santa Maria Assunta on Torcello for yourself with this lovely video. 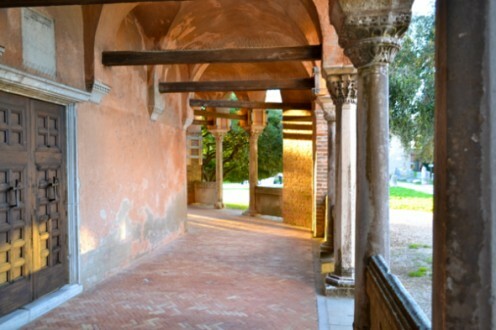 The main attractions on Torcello are open year round but with slight changes for the season. In general plan for things to be open 10am – 5pm in Winter months, and 10:30am – 5:30pm in April through October. The Museum is closed on Mondays.I would recommend visiting Torcello in the later afternoon – it is typically quieter with fewer tourists, and Torcello is a lovely place to watch the sun beginning to set over the lagoon.There is not a lot to shop for on Torcello; just a few merchant stands selling trinkets and souvenirs plus lace from Burano. There is a public (pay) toilet facility, and restaurants open for lunch and dinner. Octopus and Pine Nuts in Balsamic: a delightful amuse bouche served at Osteria Al Ponte del Diavolo. Osteria Al Ponte del Diavolo This beautiful, elegant restaurant would be my recommendation for anyone interested in a wonderful Venetian meal while visiting Torcello. Fresh, seasonal fare is prepared showcasing ingredients grown in the restaurant’s own garden. Read my review at my food blog, South Jersey Foodie! 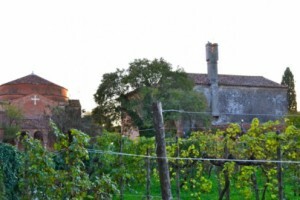 Villa 600 A highly rated restaurant on Torcello in a peaceful, tranquil setting. 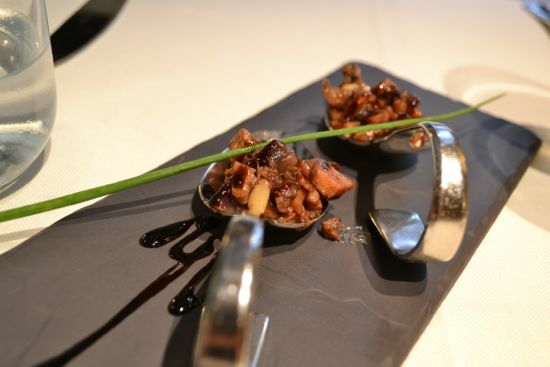 Ristorante Al Trono Di Attila Noted on Tripadvisor for having modest but good plates of typical Venetian food. Locanda Cipriani Still owned by the Cipriani family (reknown for the famous Harry’s Bar in Venice proper), this restaurant is also part of a small hotel on Torcello. Reservations are a must!